Kitchens are among the most beloved rooms in the home. Whether we use them for entertaining, preparing and serving food, or just spending more time with the people we love, kitchens are multi-purpose havens that, often times, we spend each and every day in. Seen as the centerpiece of most homes, we like to keep the kitchen looking its particular best – which begs the question: In 2017, what are the best ways to keep our kitchen looking up-to-date, contemporary, stylish, and technologically relevant? Well, we at K&B Unlimited are firm believers in wanting to make consistently progressive updates to the world of kitchen design – and, with 2017 starting to take shape, we have many different ways to bring your kitchen into the New Year with style and sophistication. Though there are numerous kitchen design trends for 2017, many of them can be categorized into three main classifications: Alteration of color scheme, improving functionality, and creating a style that’s all your own. When comparing the many expert opinions on how kitchen design trends will progress heading into 2017, color selection is certain to be a key element in creating a unique kitchen renovation. Not only this, many suggest implementing an alternation of colors as a great way to set your kitchen apart from the others. For example, redesigning your kitchen can be as simple as picking a new scheme, helping to redefine the look of your kitchen altogether in a manner that’s cost-effective to boot. HGTV primarily recommends two color schemes to consider for your next kitchen renovation project. Classic Black & White – Though the practical look of this palate may change over the years, black and white is a classic, contemporary style that never gets old. With a balance that can be found between country-style and modern homes, black and white is a must for those looking for a simple kitchen design. Gray Accents – Lately found replacing white in many kitchen designs, gray is an excellent choice of color for recently installed cabinets, helping to bring in a softer, yet still striking look to most kitchens. Where white can often seem blinding in most kitchens, gray still boasts a lighter shade, while being easier on the eyes. Additionally, in Forbes recent overview of emerging kitchen design trends for 2017, many home design experts also saw green as an emerging color for kitchen renovation designs. Not only this, but when mixed with practical hardwood floors in the kitchen, the right shade of green can help to bring out the loving nature of any nature-lover, helping to bring them closer to the great outdoors than ever before. A fresh coat of paint will only get a kitchen renovation so far, however. In order to fully immerse yourself in an all-new design, it’s recommended by many experts to also apply your decided color scheme to other elements of the kitchen. HGTV has a few ideas for how to make these attributes really stand out. Sinks­ – In the grand shuffle of a kitchen renovation, little thought is often put into the design or color of sinks, with most people defaulting to either white or stainless steel. However, for a unique touch, try adding a little color to your sink as a way to make a small, yet lasting impression for your kitchen. Fixtures – Whether your overall design is looking to be contemporary or classic, modern or old-fashioned, bold fixtures can make a great impression as part of any design. By putting focus on fixtures, your guests will quickly get an idea of your kitchen’s contrast, making every aspect of the room stand on its own merits. Quartz Countertops – Similar to choosing a striking color to make the fixtures stand out, adding a unique, advantageous selection of quartz for your countertops can add an exceptional look to your kitchen design. Not only are you able to draw the benefits of quartz as a material through this decision, but the sleek surface also allows for a bold look to any kitchen. Finally, when playing around with different color selections, it’s important to also consider the use of contrast in your designs to help showcase a truly mesmerizing design for your kitchen. Light & Shadow – Through the use of these two factors, you can help to create a kitchen design that stands out. Light and shadow can be played with through window treatments, the addition of skylights, and new fixtures such as track lighting. Countertop Interplay – By combining two or more different materials for countertops, the varying textures and colors can help to create a distinctive mood for your kitchen. The soft, smooth look of wood combined with a dissimilar marble, for example, is just one of the ways this balance can be sought. A Shift in Color – Not only does the basic contrasting of colors help to provide a unique approach to kitchen design, but contrasting colors from a previous design or renovation can showcase a striking change in tone for visitors. What better way to show off a completely new design than to bring out the “new you” as well? For recommendations on how to choose the perfect color palette for your kitchen redesign, you can call on the design experts at Kitchen & Bath Unlimited. We are here to provide expert advice on how to bring out the best in your kitchen renovation project. Kitchen design trends in 2017 are not just about showcasing radical designs, but also about improving the overall functionality of a household. Because the kitchen is such a high-traffic room, with many purposes and functions, it only makes sense to prepare for the future. Through both the advancement of technology, as well as the continuing strides of the American household to make our kitchens more efficient, we try to do all we can to make improvements to this room every step of the way. Through just a few simple alterations, your new kitchen can be a cutting-edge haven for efficient living. An easy way to improve functionality in the kitchen is to keep any excess appliances, cabinets, or any other means of storage kept hidden away to avoid unnecessary clutter. Maximizing Kitchen Storage – One of the many benefits of making the most of your kitchen space is being able to have extra room to both move around the area, but to also increase the storage efficiency. By utilizing innovative techniques, such as using drawers with multiple levels and creating units for specific items, you’ll be able to get the most out of your new kitchen. Hidden Appliances – Another great technique to maximize space in your new kitchen design is to find useful areas to fit otherwise bulky appliances in. Inman recommends in a recent article to do away with industrial-like stainless steel appliances and instead make the transition to hidden appliances within your cabinets, freeing your counter space for more practical purposes. Handle-free Units – We’ve all done it: We’ve been walking through our kitchen, in a frantic rush, until we get one of our belt loops on our pants caught on a kitchen hook. Well, House Beautiful foresees this nuisance as a thing of the past, as handle-free units will only continue to grow in popularity 2017. As technology continues to progress in terms of efficiency and automation, it only makes sense that our kitchen technology should keep pace. Many experts expect that kitchen design trends in 2017 will reflect the increasing wave of automated technology. Advancements in Automation – When people look at the ways that technology has advanced over the years, many may jump to a dystopian universe where everything is cutting-edge, revolutionary, and chrome-plated. However, sometimes the impending wave of technology can be as simple as turning on a faucet hands-free. This, among many other aspects of automated kitchen technology such as smart appliances that inform you when they need maintenance, are what many design experts recommend implementing as part of embracing what newer technology has to offer. Voice Control – You may have seen many different types of voice control related technology pop up over the past few years – whether it’s Alexa from Amazon, Siri from Apple, or Google Home. Voice control is undoubtedly where the next wave of technology in the kitchen seems to be heading. By adding a voice assistant to your kitchen design, you’ll be able to bring your kitchen to the next level – start a timer, ask for recipe ideas, convert units and appliances, or keep a grocery list, all with a simple voice command. Finally, improving functionality in the kitchen, in many ways, comes down to the person renovating it. Case in point: What do YOU want to do now that you have a brand new, renovated kitchen? Your creativity is the only thing limiting you from having the kitchen you’ve always wanted. The New Living Room – Think about it: With all of the entertaining that many use their homes for, it’s difficult to see why many don’t use their kitchens as an extension of their own living rooms. By using a wider-set island with more accessible seating options, you’ll be able to utilize your kitchen for anything from after-dinner drinks to board game night. An Extended Art Project – Your kitchen doesn’t have to be solely for entertaining and dining – it can and should be an expression of yourself. Use your kitchen to show off your personality and give guests a deeper reflection of yourself. However, in order to do this, it’s recommended by many experts to help make the initial design specific to how you want yourself to be expressed. In order to gain more of a perspective on how to improve functionality in your kitchen, Kitchen & Bath Unlimited is able to aid in design and meet your exact specifications to help you get the most out of your new kitchen. Finally, heading into 2017, it’s recommended by many experts that your kitchen design has a clear direction, allowing you to develop the perfect look for your kitchen. However, in many cases, developing a definitive sense of style that complements and reflects your tastes is a lot easier said than done. The first step in developing your own unique style is to examine which kitchen design trends in 2017 are starting to take hold, emerging into more and more homes. Industrial – House Beautiful recommends considering an industrial look for your home – a trend that has continued to emerge over recent years. Exposed brick and pipes, pastoral metals, and understated furniture often define this look. By combining wood, stone, and concrete with the right vision, the look is able to echo multiple tastes and ideals at once. Contemporary – If you are looking to renovate your kitchen with a flooring design you’re already attached to, a contemporary look is great method to salvage what still works with your existing kitchen. Combining modern cabinets and a wood-plank design with an older style floor pattern is a great way to get the best of both worlds from multiple designs. Farmhouse – If a rustic mood is more your style, many sources agree that a farmhouse-style kitchen design continues to age well over time. This can be accomplished through muted, dark colors, granite countertops, or heavier accessories to showcase a visual weight across larger kitchen setups. While determining a set style for your kitchen is an important first step in truly figuring out what your renovation project will look like, it won’t be until you’ve taken expert advice on how to further develop your kitchen layout that you should move forward. Tuxedo Kitchen Cabinets – If a contemporary path is what you’re looking to go down for your kitchen renovation project, you may want to consider tuxedo kitchen cabinets, as recommended by Inman. With a black and white pattern, or even navy blue or soft gray color palette for a softer contrast ratio, your design can help showcase a unique look for any contemporary kitchen. Wood Paneling – If the rustic mood is what strikes you, then the addition of wood paneling may be what you’re looking for. With many options for color, style of wood, and contrast, wood paneling is just the right material to take you to the cabin without having to walk out your front door. Exceptional Finishes – When deciding what finish you should use for your kitchen countertops, experts were split on which are the best decisions. Inman, citing a love for gold and copper, recommends finishes with harder, more mundane steel looks. Additionally, Apartment Therapy recommends a deeper bronze look, as opposed to a natural shine that tends to bring warmer finishes out. Before putting the finishing touches on your kitchen design, there are a few helpful hints to keep in mind before you officially call your kitchen your own. Though these may seem a little obvious, it never hurts to have a little added perspective on such an important project. Flexible Palette – Though we all have a set group of colors we like to keep in mind when designing our “dream kitchen,” if one piece of advice can be given, it’s to stay flexible when it comes to choosing colors. HGTV’s top kitchen design trends for 2017 highlight keeping an open mind to the ways that colors can interplay with each other, which can result in a design possibility that you may have never envisioned. Matching to Your Home’s Style – One of the biggest pieces of advice that one can offer to someone looking to do a renovation to their kitchen is to simply keep it to the style of the house you’re creating it within. Though it may seem tempting to try something completely new and radical, it’s important to keep your designs in line with what you’ve already established with the home you’re placing it in. In conclusion, there are many helpful kitchen design trends in 2017 to keep in mind when planning a kitchen renovation. After analyzing and crunching the opinions of multiple experts across many different perspectives, it became clear that many of their opinions could be boiled down to alternating colors, improving functionality, and developing a unique sense of style. When alternating colors, selecting a distinct, consistent palette across the room, utilizing that same palette when it comes to appliances and sinks, and contrasting light and shadow are among the most helpful pieces of advice. When improving functionality, it’s important to create “space” whenever you’re able to; this can be accomplished through utilizing innovative storage concepts. You should also look into home-automation advancements and voice control technology, as well as consider new purposes for your kitchen – such as serving as a space for crafting or family activities that don’t involve eating. Finally, developing a sense of style is essential for any new kitchen renovation, which can be done through adopting a flexible color palette, branching off of an already popular theme, and utilizing specific touches to improve the overall flow of your kitchen. For all of your kitchen design needs, you can turn to Kitchen & Bath Unlimited for expert design advice. You can also count on us to provide quality materials and professionally install of all your new kitchen materials. 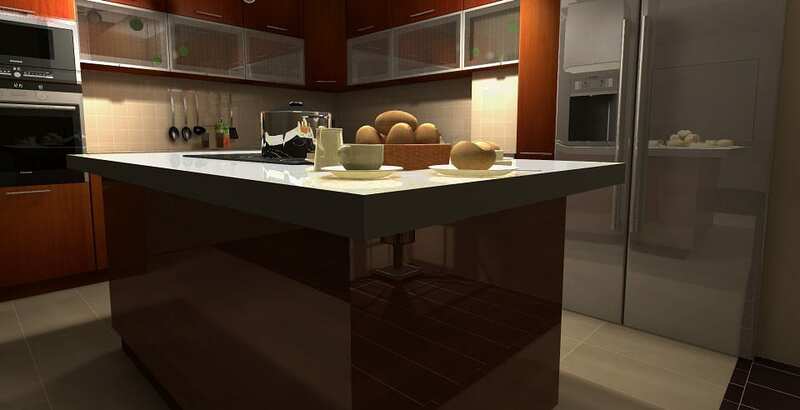 We are here to take the stress out your kitchen design and renovation.